Doing Holidays with Friends, Thoughts? This year, we have been more or less forced to do Christmas a little different than normal. We aren’t heading north to see my family and we aren’t heading back to Texas to see Mike’s family. Since I will be almost 35 weeks around Christmas and with all the traveling we have already done this year, we decided it was time to settle in for the winter and spend Christmas at home. We have no family in Raleigh or anywhere surrounding the area. Thus, we had more or less thought, we would have a quiet and slow Christmas just the two of us. As we began talking with friends, it sounded as if we weren’t the only ones deciding to stay close to home this year. Mike and I have always spent our holidays with family so to think about spending a major holiday with friends is a whole new concept for us. Instantly, we were glad to have friendly faces to cook a meal with and celebrate the day with. It made it seem extra special even though it sounded fun to just do our own thing as well. 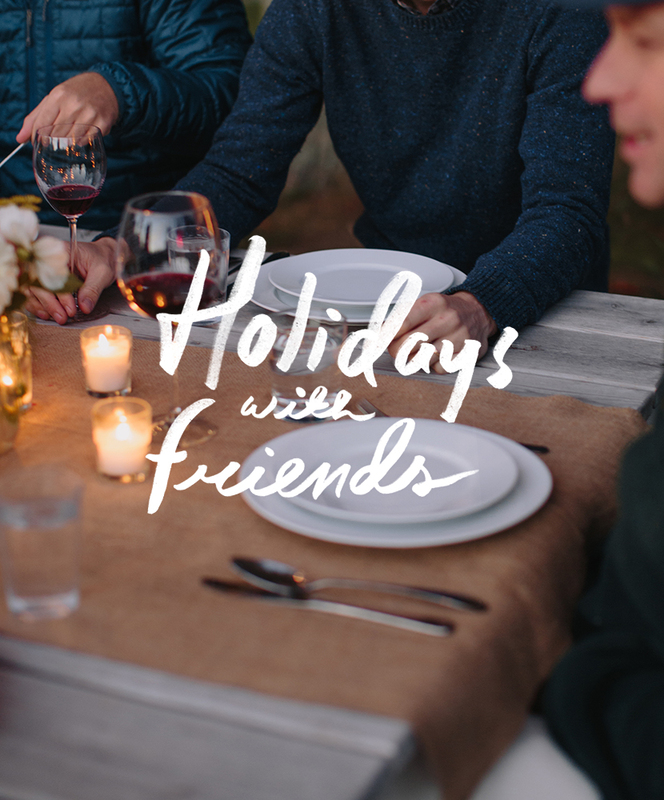 There is something about a holiday that makes you really want to have company to celebrate with, am I right? I am sure many of you have spent holidays with friends before whether you met them weeks before or have known them for years. Life takes us on wild journeys and we find ourselves at various places in life sometimes around holidays. This year is a year where life has taken us on a slightly unexpected path. It is a path we are loving and embracing, but it does mean things feel a little different than normal. Passing on my northern Michigan winter was a little difficult since I miss the snow so much, but I know next year it will be pretty magical with our little guy in attendance with us. This year though we will be gathering with our friends, feasting, celebrating, staying cozy, and making new memories I never expected and there is so much beauty in that. I am not sure what to expect in this new experience and I wanted to hear from some of you about how you have celebrated Christmas or holidays with friends in the past. Are you someone who always does this or would this be just as shocking to your system as it is to me? I think it is a really fun new adventure to celebrate a holiday like this in a new way, but I won’t lie that there is a little sadness to miss our norm and not see either of our families, thus why we saw both at Thanksgiving. New experiences always bring excitement, but change is always a little hard to swallow even if it is a short-lived thing. So, tell us your stories…What kind of advice do you have? Is there a way you coordinate with your friends for the day of festivities? I am sure some of you have some great stories to share! My husband is in the military so over the past few years we’ve had more and more holidays with friends. i’ll admit it was an adjustment for me, but moving around every few years this is a reality for us and one I’ve come to love! being able to provide a place for folks to go and share their own traditions with others is so fun. Sounds a little corny but we always have a pot luck sign up type of deal, so that people can have a chance to share their own traditions with others. if your grandma always made that certain dish or dessert, awesome, bring it and we can all try it! for us it’s become such a fun way to not feel like we’re missing out on our family but that we are getting to experience so many other peoples families too! My husband and I have spent many holidays at our home together without our families over the years, since we have lived so far away. While we do love spending Thanksgiving and Christmas with our families, we look forward to spending them at home with our dogs! I would just say, uphold family traditions that make the holidays complete and create new traditions for yourselves. Typically we celebrate the night before with friends, spend the morning opening gifts and eating breakfast/watching movies alone and then make time to do something outside in the afternoon with other friends. Enjoy your last Christmas as a family of 2! You’re not missing much! No snow! I think spending the holidays with friends has been easier than the first time with my inlaws! haha. Not that my inlaws aren’t amazing (because they really are) but with friends you can kind of pass off some things as “ok for you but not our thing” as with new family you begin to wonder “this is what I married into? ?” But for holidays with friends, I think letting everyone bring their own pieces of tradition in is important, even if it isn’t how you’d do it yourself. My husband is the cook in our family (and our circle of friends) so he always makes a giant ham and everyone else brings other dishes. last year we did Christmas morning on our own and then had several people over on christmas afternoon. it was so fun to hang out, eat lots, and play games (heads up is always a hit). this year, we are overseas and two of our best friends are coming to spend the holidays with us. I’m a bit nervous as this doesn’t leave any time just to ourselves, but i’m making the most of it by crafting stockings and planning a cookie bake. All in all, Christmas with friends is amazing and I hope you have a wonderful experience this year! !